I am referring to Lou Tice–author of Smart Talk and founder of The Pacific Institute. A mentor and GOODe friend of mine introduced me to Mr. Tice (via his book–not in person) and his Smart Talk and I have to tell you it really changed the way I think about a lot of things. So, I did and guess what? Now I go around tellin’ (and sometimes throwing copies at) people that they GOTS to read this book and they GOTS to sign up for PX2 group on Facebook to get regular encouraging messages from Tice. Now, don’t get me wrong–this book ain’t magic. Truth be told, it ain’t really anything new. I am always struck with how much scripture comes to mind when I read Tice’s stuff. But here is the glorious news: YOU always have a choice in how you react and in determining YOUR next step, regardless of the circumstance. Your choice may be to let something happen and not get upset about it. It might be to find a creative solution. It could be in how you choose to feel about the situation. Bottom line is YOU have control of YOU–not the circumstance or situation or relationship or schedule or job or __________. That is the glorious free will our creator gave us. Plain and simple. Are your toes hurtin’? Mine sure are. The tough talk is really for me ladies and gentleman. I gots lots going for me, but I have my own challenges–just like everyone else– and they have been getting the better of me. Truth be told, my attitude is well below where I’d like it to be. Some days my attitude is just rotten… Just sayin’. And, frankly–I am better than this ya’all. So… now that confessional is over, let’s dive into Chapter 1: The Here and The There. Tice talks about how believe =achieves. The old adage “If you think you can or you think you can’t, in both cases you are right” comes to mind. We hear these things everyday, but have you ever REALLY thought about it? If you think you can’t, you aren’t going to try… even if you “have to” due to circumstance. We humans are pretty ego driven…so if you have told yourself you can’t, you are certainly not going to try to prove yourself wrong. However, if you think you can, you set yourself up in problem solving mode. I heart problem solving–truly, I do. It is the BEST form of creativity. It is just changing the way you think about a situation. Tice says “If you change the way you think, you change the way you act”. This isn’t ignoring problems or heading off to lala land with rainbows and butterflies… it is changing your thinking to help you make change. For example: Say you rip the seat of your pants (never happened–honest 😉 ) and you don’t notice. You go walking around all day…You be thinkin’ nothin’ be wrong and therefore you act like nothin’s wrong. Suddenly a draft hits your bum and now the world must STOP until you find a solution to your problem… It’s been there all day… but now, now you are uncomfortable. Now your thinkin’ has changed and now I bet you get creative real fast. Ya might change pants…ya might sew it up… ya might find a nice magazine to temporarily cover your bum… ya might run to the bathroom and cry and then do something… point is, it is up to you. PSSSTTT… YOU ARE WALKING AROUND WITH A HOLE IN YOUR PANTS. We only got one life to live and Tice reminds us that our “current reality is not fixed”. Don’t get “trapped in the mistaken sense of this is the way it is“. Tice teaches that you should start with “the why and the what” you want with “the end result” in mind and let the “how” come later. It is this type of thinking that I first noticed from my friend that led me to ask about Tice. I saw her living her life in such a powerful way and she shared with me how she always thinks of the solution or goal and the “how to get there” falls into place when she is truly focused on her goal. Wow. You mean I can dream again? Really? I thought the hamster-wheel of adulthood was about getting real and makin’ due. Tice reminds us that “the only thing that is going to stop you is your lack of vision, lack of mission, old patterns, old habits, old excuses and beliefs that are inappropriate”. Tice encourages you to develop “your why and your what” and engage in positive self talk and influence positive talk around you… negative talk just brings everybody down dude. Goode stuff! I'll look forward to this each week! My hubby always say that people deserve what they get…Tough one. Is there a like button? 🙂 I will definately be picking up a Lou Tice book in the near future! You're such a creative soul:) I've always loved that about you since we were kids! Following you now. Please return the favor! I post original stories and poems on family, kindness, peace, and faith. Thanks for the great post! Sure gives me a lot to think about! Have a happy day, and thanks for taking the time to tell us about Tice! p.s. thanks also for the well wishes for Spencer ! This is deep for me to read on a Friday morning! Kudos to you for changing your attitude – mine often needs and adjustment as well! Hi! Friday Following you! Great post! I am with Kerin…I'll do the hard work and prayer sure helps me do more knowing that I am not alone! I am all for turning my worries over to Him so I can focus on the doing! Even as I write this, I'm thinking of excuses – places to put the blame. My thyroid, my husband working too much, my little buddy who keeps me from getting things done, etc. etc. But I'm going to put those out of my mind and work on organization only! I'm totally looking forward to next week! Glad you guys like the Tice Talk! Those who want the book, you will need to order it online since it is now out of print. I got mine for $5 on amazon. Kerin & Smart Money Mom- Prayer is a critical part for me as well. God gives me the strength and purpose for my life. And, I believe He has used Tice in a positive way in my life. Katie- I am right there with you on the need for organization (and the messy house, helper and stress)! 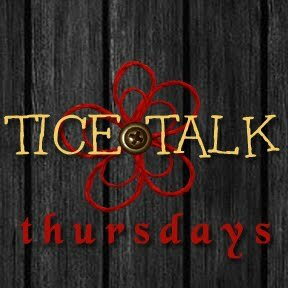 I am countin' on some Tice Talk to help me get there too! Welcome to the Friday Followers!